1) First up, Berkeleyside brings us the story of My Chan and Kim Phuong, owners of a Chinese vegetarian restaurant in North Berkeley called Vegi Food. After 28 years at their current location, the couple fears for the future of their business, as the building that houses the Vine Street restaurant has a new owner who wants to perform a seismic upgrade and, perhaps, replace Chan and Phong with more lucrative tenants. 2) Among the many stories coming out of last week’s SF Chefs festival, Bay Area Bites has one centered on a familiar face for East Bay fans of Ethiopian food: Cafe Colucci owner Fetlework Tefferi. Tefferi teamed with celebrity chef Marcus Samuelsson (of Top Chef Masters fame) to demonstrate a traditional Ethiopian coffee ceremony — something visitors to the Grand Lake Farmers’ Market may have had a chance to experience. 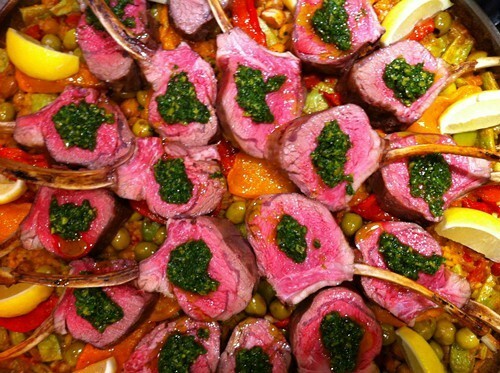 Lamb chops that might be on the menu at Duende (via the restaurant's website). 3) Some previews of new restaurants coming to Oakland, in and around the Uptown ’hood: Loring Cafe, a Minnesota export offering “bohemian luxe fine dining” (37 Grand Ave.); Oliveto alum Paul Canales’ ambitious Duende (468 19th St.; construction photos courtesy of Inside Scoop), and a restaurant called Township (1542 Broadway), from the founder of an Oakland-based urban farm. Loring Cafe and Duende are both slated to open in the fall; we're still waiting for more information about Township. 5) According to Tablehopper, Haven has started serving Sunday brunch from 10:30 a.m. to 2 p.m. — it’s $25 per person for a family-style meal. Last week’s offerings included strawberry pop tarts, braised bacon, slow-poached eggs, and biscuits. 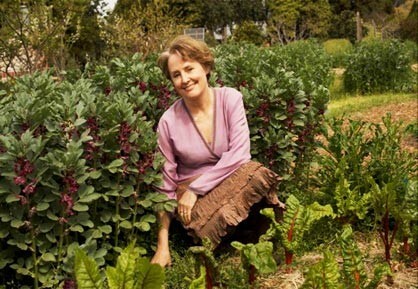 6) Inside Scoop reports that Chez Panisse grand dame Alice Waters and the Hyatt hotel conglomerate have entered into a partnership to provide healthy, organic children’s meals at all Hyatt hotels in the US. Waters herself is designing the menus and working with Hyatt to source local ingredients. 8) Finally, Waters herself won’t be in attendance, but a group of Chez Panisse staff and alum are planning a “gourmet global diplomacy” trip to Cuba this December. The delegation will include current Chez Panisse downstairs chef Jerome Waag, Pizzaiolo’s Charlie Hallowell, and Acme Bread’s Steve Sullivan. Berkeleyside has the story.